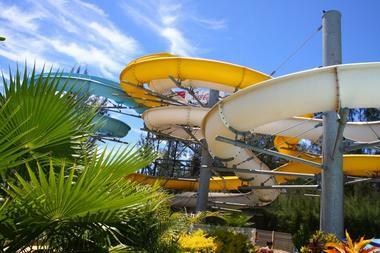 The water park faces the beach of Etang Salé and is located in a secured area. Attractions at AkOatys include 3 giant waterslides suitable for the whole family, 2 waterslides for those in search of thrills (for anyone 1 metre 40 tall or over), a children's swimming pool with enchanted castle, an adult pool with whirlpool and a standing wave for surfing. The water park also contains a picnic area (glass bottles and containers prohibited). Deckchairs and left-luggage lockers at extra cost. Washrooms with changing cabins. The Cafeteria serves cooked dishes, sandwiches, salads, ice creams and a variety of drinks. Open from October to March, during local holidays, and on weekends. Family, club/association outings, birthday parties. Environment / Access : Take the road to Etang-Salé les Bains. At the roundabout, turn off towards the beach. 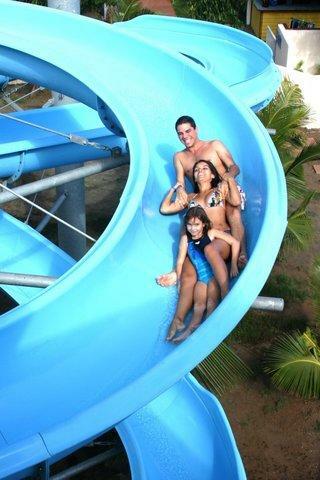 The Water Park is across from the beach car park.